1. The first step is for government to define a unit of account. A unit of account is a monetary standard of measurement, just as the yard or meter are measures of distance. The dollar, yuan, yen and pound are all well known units of account, and there are many other examples. 2. 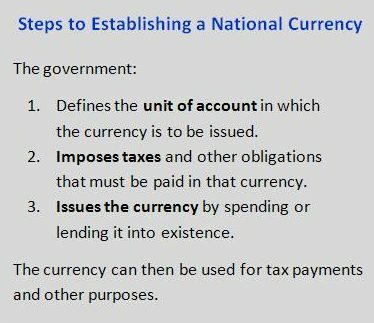 The second step is for government to impose taxes payable only in its currency. For tax purposes, income and assets are assessed in the government’s unit of account. The same is usually true of court settlements involving monetary damages. The tax obligation, provided it is effectively enforced, ensures a demand for the currency. It means that most people need to obtain it, even if only to pay taxes. 3. The final step is for government to issue the currency. It does this by spending or lending the currency into existence. Nobody can obtain the currency or pay taxes before this occurs. Because people are willing to accept the currency, the government is able to spend it into the economy, purchasing things from the community. Government makes pay offers in its currency to entice some people into public-sector jobs. It also buys products from businesses, paying with its currency. In this way, some labor services and resources are moved to the public sector to carry out government functions. Once established, the currency is also useful for other purposes, such as buying and selling in private markets, and saving. Even people who do not have to pay taxes will accept the currency because they know a demand for it has been established. In this way, use of a currency typically becomes widespread within the nation of issue.